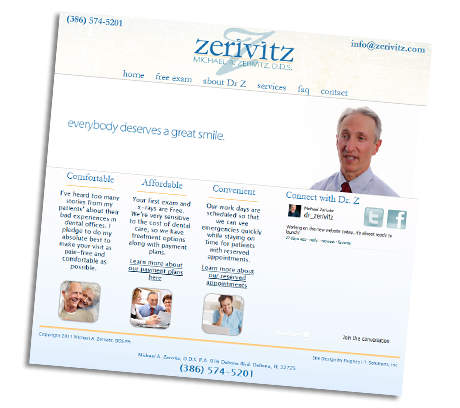 Deltona Dentist Dr Michael A. Zerivitz had some very specific goals and design ideas in mind when he came to us in March of 2011. He wanted a website that was visually appealing, had a modern look, and integrated video and social media. Video was provided by Imprint Cimena, who's work turned out great. The videos are played automatically when the guest enters the home page and the free exam page. 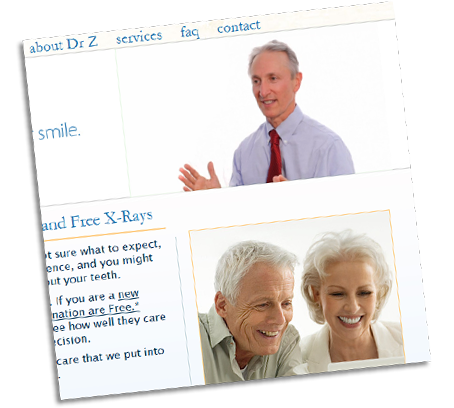 Another important design note was the age demographic of Dr Z's clients. While he treats patients of all ages, he stressed that the site be user friendly to someone without perfect vision. We made sure to provide more contrast in the text, as well as increase the size to accomidate his visitors. Lastly, we started an SEO campaign to increase traffic to the site in his local area. This is an on-going project.